2014 is our 10th anniversary. 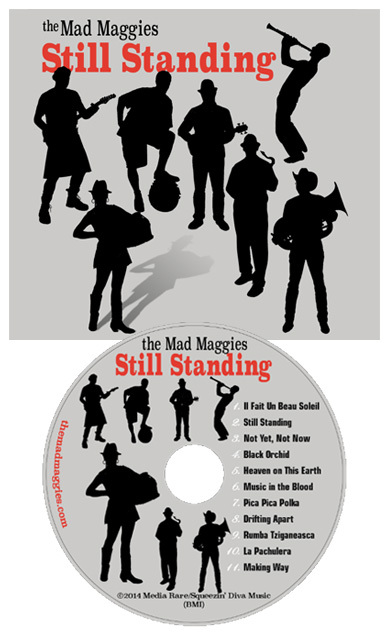 In honor of our resilience and, especially for your listening enjoyment, we present our latest album of “hard to describe, easy to love” tunes — “Still Standing”. Six tunes are new and original and, as always, all over the musical map — ska-inspired, rap inspired, balkan/jazz/rock/folk inspired. Four tunes are favorites that we felt deserved to be re-recorded as they have morphed considerably from when we first recorded them. And we couldn’t resist including the Rumba Tziganeasca which we love to play live but had never recorded. All in all, it is another mad, musical voyage. Listen to the tunes right here. We’ve cued up “Not yet, Not Now”. Recorded, mixed and mastered by Wally Sound, Oakland, California. Thank you, Wally! Music in the Blood — a quirky sing-along in honor of large brass, with hints of polka. Go, Johny! Pica Pica Polka — southwest inspired polka with a long tail. Making Way — ska instrumental propelling us forward. The Just Plain Folks Awards 2017 honored “Still Standing with two nominations!